UK based DJ Munks uses cyn.in as his blog to share his experiences as a disc jockey. He specializes in Indian theme parties based on the latest Bollywood tunes and remixes them with loads of Bhangra and R&B. DJ Munks is studying music in the Glamorgan University in the UK and has been using cyn.in as a journal to announce the events that he has been a part of. He has published some supercharged pictures of the events he has performed in along with videos that showcase his skills. Don’t be surprised if you find him pose with one of your favorite celebrity DJ! He has been performing at popular UK clubs and various parties. His cyn.in site is called “Music Religion” and is true to its name. The site has announcements and reviews of the events he has performed. Munks’ talent shines through his blog as well as the videos published. For all you music lovers head over to http://munks.cyn.in and dig into pleasing music, euphonious pictures and get a teaser on the latest events happening in the UK. 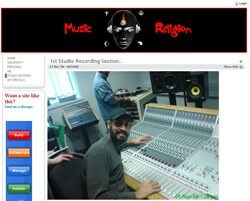 Music Religion is the cyn.in showcase site of the month.